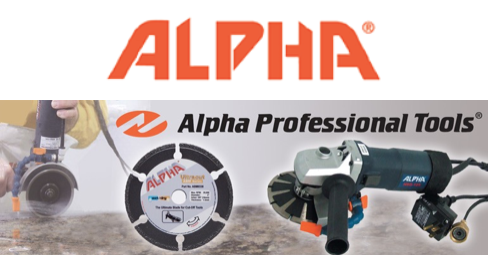 Alpha Professional Tools® was founded in 1986 and has become a leading manufacturer of quality tools for professionals in the natural/engineered stone, porcelain, ceramic, glass, construction, marine and automotive industries. Alpha® provides the best products for cutting, drilling, shaping and polishing all types of materials. In addition to providing the best products in the industry, Alpha Professional Tools® offers a variety of services to support their products. Alpha's Professiona Industrial Tools include: Cutting Kits, Cut-Off Tools, Polishers, Grinders, Grinding Kits, Gear Action Sanders & Polishers, Palm Sanders. There are also a variety of Grinding Wheel Adapters & Accessories, Fire/Rescue Equipment, Metal Cutting Blades. Alpha's Polishing systems include Diamond Pads, PVA Dry Polishing Discs, Finish Sanding discs and Antique Polishing Wheels. Edge Grinding, Surface Grinding like the Spike Vextra and Ultrazip Flap Wheels, and the Reznet Sanding system. Industrial Tools: Cutting Kits, Cut-Off Tools, Polishers, Grinders, Grinding Kits, Gear Action Sanders & Polishers, Palm Sanders. Edge Grinding, Surface Grinding like the Spike Vextra and Ultrazip Flap Wheels, and the Reznet Sanding system.